River Tornionjoki is a major stream flowing almost in a natural state on the border between Finland and Sweden. On River Tornionjoki, salmon are mostly pursued by trolling plugs on rowing boats. You can also fish from the banks. Anglers use spoons and flies on rapids areas. Jigging is fun, active and eventful! Zander are pursued with jigs in bay waters, shallows and slow-flowing sounds in the beginning of the season and at the edges of mid-lake shallows and rocky areas in summer. Hook-and-line angling is suitable as a holiday activity for the whole family. Roach is a certain catch for anglers. 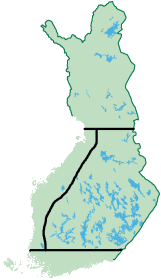 Angling with a hook and line is the most popular form of fishing in Finland. Ice-fishing is a major hobby for many people during winter months. At some point in their life, almost every Finn has sat by an ice hole, ice-fishing for perch, the national fish of Finland. Signal crayfish are caught on the rocky bottoms of lake shores and shoals. The suitable catch depth is usually 3 to 6 metres. Crayfish parties in good company represent the Finnish autumn atmosphere at its best. Rainbow trout is a common game species on River Merikarvianjoki and on many other rivers and rapids fishing sites in Finland. Rainbow trout are pursued using colourful flies, small plugs and spoons. The Archipelago Sea is the largest in Europe and among the most extensive archipelagic complexes in the whole world. For rod anglers, the number one species of the archipelago is pike.